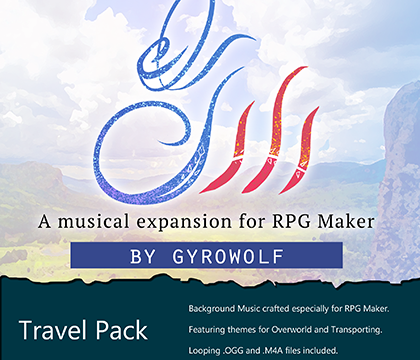 G3: Travel Music Pack| RPG Maker | Create Your Own Game! Give your heroes a song to march to with this travel inspired music resource pack for RPG Maker. Created by Gyrowolf, this pack contains 10 high-quality themes. Ranging from classic RPG inspired sonatas to guitar-backed BGMs; Taking your adventures from the mountains and seas, all the way to the clouds and beyond! 5 Field BGMs containing themes inspired by a wide variety settings. 5 Transport BGMs created for all kinds of scenerios. Boats, animal, rockets, you name it! Each song was carefully crafted for RPG Maker, and loops seemlessly in the program.